How do you describe your lab to visitors? Our Berlin studio is nestled among a bunch of creative businesses in a back courtyard in the heart of Kreuzberg. Before you even enter the studio, you’ll see people working away and having meetings at outdoor tables. Upon entering, you’re greeted not by a reception desk but rather by an open kitchen and a long table—which means we’re often mistaken for a cafe. These little details help create an atmosphere and environment that allow us to collaborate flexibly, bolstered by the open-plan seating, fishbowl meeting rooms with walls covered in Post-its, and workshops filled with everything you could need for physical and digital prototyping: 3D printers, laser cutters, soldering machines, tools, and an HTC Vive setup for prototyping in VR. What is a unique feature of your lab? Both our studios—in Berlin and Munich—were specifically chosen for their abundance of open space and their ground-floor locations. This makes it easy to work together in teams, and also to welcome in partners and the wider community for workshops, talks, meet-ups, and parties to share knowledge and ideas. 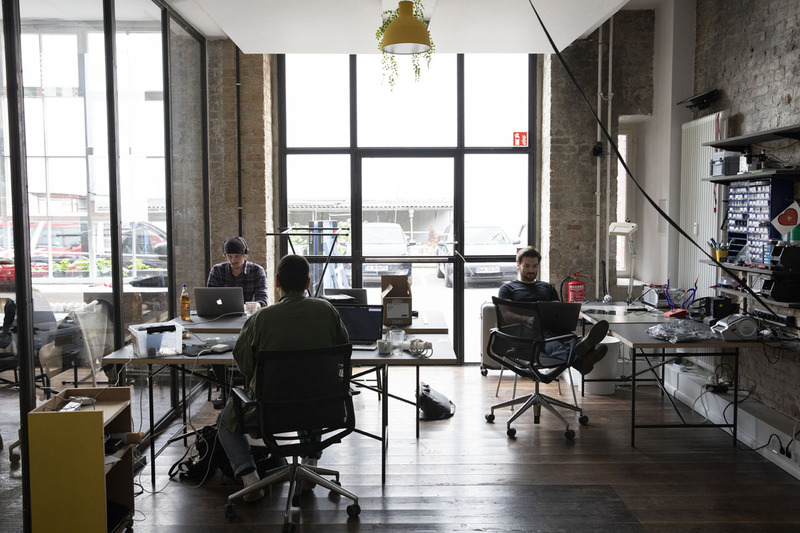 This open-door policy means the space is always buzzing with activity and a whole lot of creative energy. How many people are in the lab, and what is the mix of backgrounds and roles? We are currently about 85 people across our two studios. We are from diverse backgrounds, including designers, technologists, researchers, and entrepreneurs who work together in multidisciplinary, self-managing teams. However, we choose to define ourselves not by our job titles, but instead by various skills, which we continue to build upon both personally and as an organization. Right now we have 10 core skills and skill owners/experts, who act as mentors to other team members. These skill owners help us develop and best utilize our expertise in areas such as user research, creative technology (physical), creative technology (digital), organizational design, strategic design, industrial design, legal design, storytelling, and data science. Briefly describe a day in the life of your lab. There is a lot going on here in a week, and every day is different, so I’m going to give you a mix. Let’s say it’s the day of a Pre-Work Talk, which is a monthly event series we’ve been organizing for over 10 years where we invite two inspiring speakers to give a talk or take part in a panel discussion. The event draws around 100 to 150 people in Berlin for what’s always a great morning of informal open dialogue, with a vibrant and engaged community of designers, creative technologists, researchers, and entrepreneurs. After that’s wrapped up and we’ve done some casual networking over coffee, people disperse either to workshop rooms or to wherever they feel like sitting for the day. Every Tuesday we have a team lunch where a chef comes in to make us a meal that we eat together; then on Wednesdays we have a lunchtime skill exchange where people can choose to attend (via video link if they’re in the other studio) a presentation or demo from a fellow team member based around their skills. We often have clients who work alongside us in our studios for days or weeks at a time, depending on the project, so there’s always something different going on and people to engage with. Also, as most of us work a 32-hour week and take Fridays off, we have Thirsty Thursdays: The fridge is stocked for us to wind down together before we head off for the extended weekend. What is one feature of your lab that you could not do without? There are many creative prototyping toys like the laser cutter that we can’t do without, but if we’re talking about a feature, we all really value our weekly team exchanges. That includes both the lunchtime skill exchanges and Tuesday’s Team Exchange, which allows the whole team—regardless of whether you’re in Berlin, Munich, or your home office—to connect and share news, updates, and project lessons and highlights. What is the one thing you see as most important about the work you do there? We strive to be a purpose-led organization, that purpose being to create desirable and lasting impact by empowering individuals, teams, and businesses. With this purpose underlying everything we do, we aim to be an organization with ambitions that tap into a universal need; that places humans at the center; and that takes responsibility for the impact we have on society. By leveraging the power of prototypes, we enable people to experience the positive impact of change. A big way in which we put that into practice is by prototyping, both on ourselves with new internal processes and also in the services we create. We are continuously carrying out in-depth user testing, and by leveraging the power of prototypes, we enable people to experience the positive impact of change. This forms the foundation from which we can help companies design new service ecosystems and bring relevant innovations to market.